Extreme gardening: it’s a fact of life in the Bow Valley and we have to be up to the challenge. If you can be a successful gardener in the Bow Valley, you can probably garden anywhere. I have gardened in Cougar Ridge in Calgary, and in Heartland in Cochrane and my biggest takeaway is this … exposure is everything. Whatever we can do to minimize exposure in our yards, the happier and more productive our plants will be. A google of plant hardiness zones for Alberta tells us that Cochrane is a zone 3b. On the Canadian zone scale, 0 is the harshest and 8 is the mildest. The lowest temperature in a 3b zone is anywhere from -37.2C to -34.5C. Perennial plant tags usually tell us which zone the plant is hardy in. So plants that are rated between zone 0 to 3 are the best choice for our climate. However within a 3b zone there will be areas that can grow zone 4 (or even 5) plants and other areas that should play it safe with zone 0 to 2 plants. It’s all based on where your yard is and how much exposure to the elements your plants will get. Think winds from all directions, direction of sun, hours of sun, shelter from solid fences/tall trees/buildings, where snow piles up or blows away, etc. Even within each person’s yard there will be different zones or microclimates. A perennial plant is one that goes dormant for the winter, but comes back in the spring. 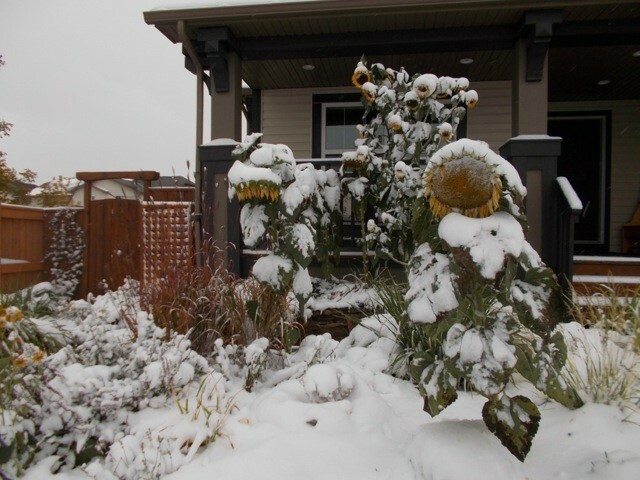 If the winter temperature is too cold, that plant may not come back in spring (for zone 3b this would be a temperature lower than -37C). On Dec 31, 2017 at 8:30 AM it was -37C in Cochrane with a wind chill of -48. I’m not sure how happy my perennials were with that; I guess I’ll find out in the next few months. It looks like winter of 2017/2018 will be our test winter as to which plants survive best. 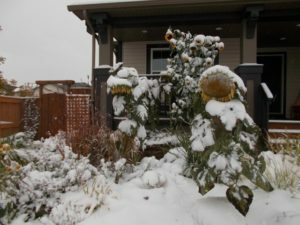 Luckily, in anticipation of a harsh winter, I made sure that all my plants were well covered with bark mulch, and I piled up mulch around the roots of sensitive plants. It’s helpful to add mulch after a freeze up as well. 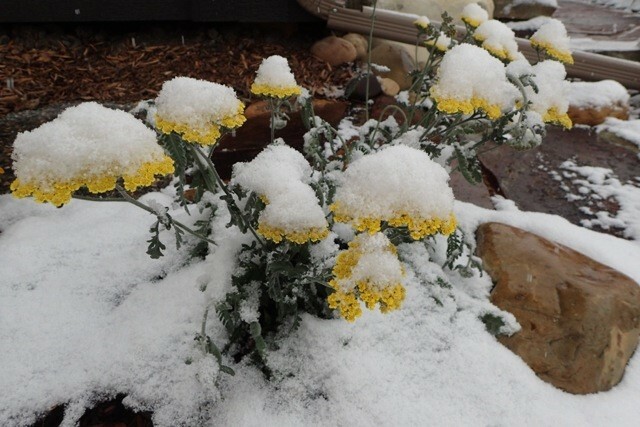 Also, when there is a lot of snow, it can be piled up on top of sensitive plants for insulation. Our yard in Heartland is extremely exposed to winds from all directions. Our poor little front yard apple tree is whipped by the winds, but it somehow produces edible apples for us. We made the best of our location choices for the tree, giving it sun all day which it needs for production. The veggie boxes are between a 6 foot high fence and the house. The heat really builds up along that corridor on hot summer days, but it’s also a wind tunnel as the west wind zooms up and over the fence and straight through the corridor. I often plant taller and stronger plants on the windiest side of a veggie box to protect the rest of the plants in the box. I could also build windscreens. Wherever your yard is, get very familiar with every part of your yard and your own microclimates. When you seed or dig your plant friends in, give them a home in their least exposed location for best gardening success.